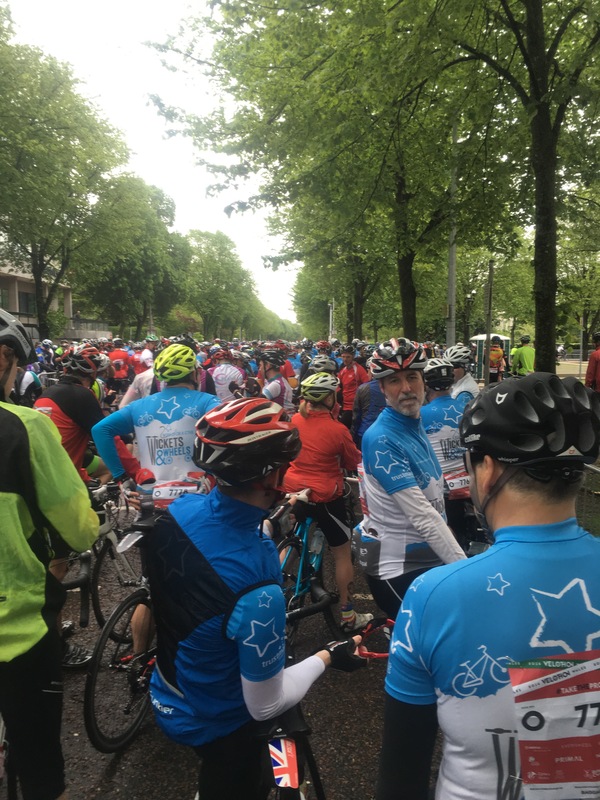 Sunday was a unique cycling experience for me, sharing nearly 90 miles of closed roads with around 15,000 other cyclists and the only vehicles there were to support and encourage us. Through rain & shine we tackled the Tumble and had a crack at Caerphilly. Tracey was keen to ride this as it was her backyard, the valleys. I was there for the closed roads, scenery, charity and a grand day out on the bike riding with company. 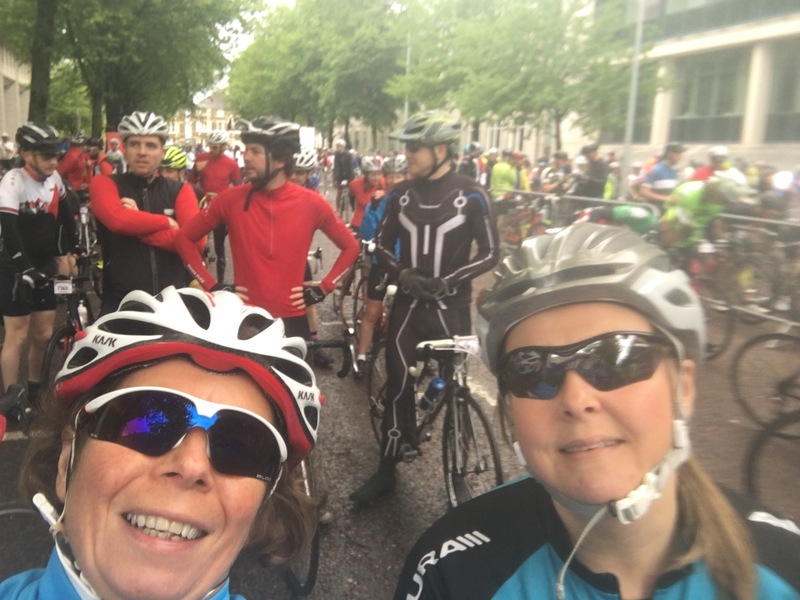 Tracey and I were riding with the 2 Wish, Wickets & Wheels charity team organised by Stuart who tragically died with his son a few months back. The organisers placed us all in the same start pen where a wave of blue & white and some red from their club colours started on mass. 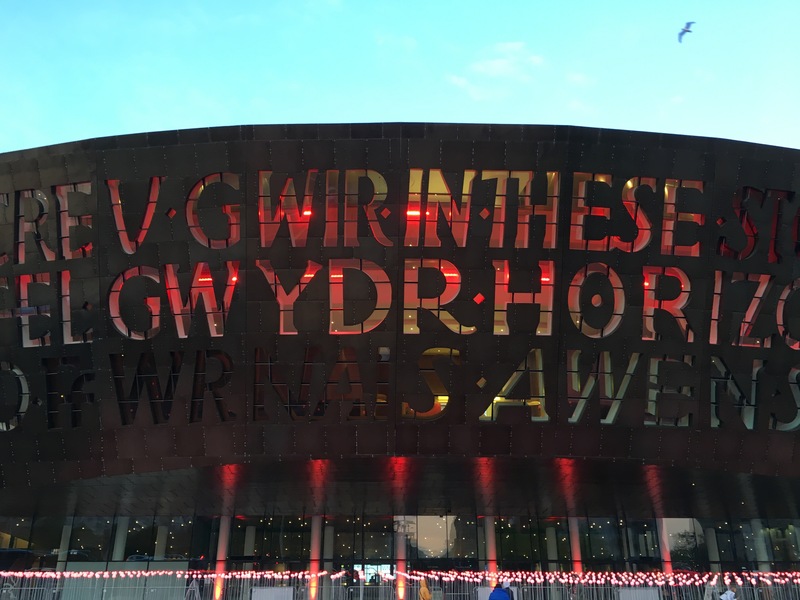 “It always rains in Wales !” well that was so true of this weekend. Saturday we got a soaking between being huddled in the registration tent then darting between the expo stalls where a guy was making a killing on waterproof jackets, which turned out to be our best purchases ever. The floating duck display was a winning selling point. Plus he gave us free waterproof caps. Good to see a few familiar faces from Calne there. We all said “well at least we have the rain today not tomorrow” – wrong ! Whilst Saturday was a torrential downpour, Sunday was variable with multiple showers, low temperatures and the odd glimpse of sunshine. 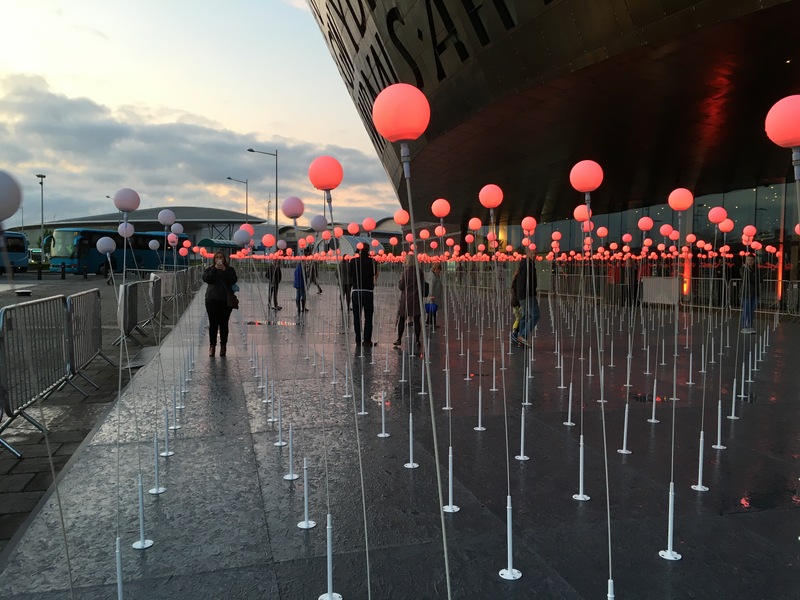 Dodging the showers we headed to Cardiff Bay for an Italian dinner to set up for the 140km ride. Passing the Welsh Poppy display which look amazing as darkness fell. Early alarm but neither of us could stomach much breakfast, we tried to drive to our allocated parking but roads were closed earlier than we expected, so back to hotel and rode to the start. We found our pen O easily and slotted in just as it was opening. It took us 6 minutes to ride to the start line as a rolling start then we were off on our adventure. A little unnerving to see two crashes within the first 3 miles. At this point before the rain even came down we agreed to take it steady and get each other home safely. The first 40 miles breezed by, saw more horses than sheep in the fields, were we really still in Wales ?! Many locals in their front gardens in their PJ’s with cups of tea in hand cheering us on, later they were at pubs with pints in hand cheering louder from behind BBQ’s and bunting. By the time we got to the first feed station I had a soggy chamois, soon followed by soggy socks. Neither was pleasant and the gritty cold water felt like I had sand in my pants for the duration of the ride. The rain jacket bought at the expo was on-off, on-off all day long. I wrung my gloves out at each feed station and wished I had my waterproof socks ! Luckily I managed to keep my pork pies & peanuts dry long enough before I was hungry, as the feed stations had little solid satisfying food on offer. My only negative of the day was the chaotic feed stations. First up of the two big climbs was the Tumble, which would have been tamed if I hadn’t dropped my sunglasses just as the gradient kicked up. Stopping to retrieve them and running downhill against the ride of slow weaving cyclists who I was asking kindly not to run them over ! I then just couldn’t get going again on the bike. Until an elderly gentleman who must have been in his 70’s offered me a push start. Well he had some strength and got me going again – thank you sir. The views and openness at the top were fantastic, a quick photo then time to put jackets back on for the flowing descent which was chilly. We saw another two crashes looking pretty bad and a few fallers, guessing that wet roads, speed bumps and slippy ironwork caught riders out. The miles ticked by, although the dual carriageway section that seemed to go for infinity and beyond on a steady 4-6% gradient was a little soul destroying with the rain and headwind. Then time to have a crack Caerphilly with tired legs, soggy shorts but still smiling as 2 Wish supporters were cheering us on. I cracked a few hundred meters from the summit when my Garmin went into Autopause as it thought I was either stopped or fallen off as going so slow ! so went for a walk with my bike. The week before the ride I had my bike serviced and thought I was riding on a 28 rear cassette, turns out I’m on a 25 ! So Wiggle has received an order for a new Campagnolo 13-29 and a shiny new chain. So life maybe easier for me in future sportive rides. Maybe this is where my extra bike strength and power has come from, hauling myself around the hills on the 25 cassette ?! With just over 10km to ride we decided to carry on past the last feed station and head for the finish. 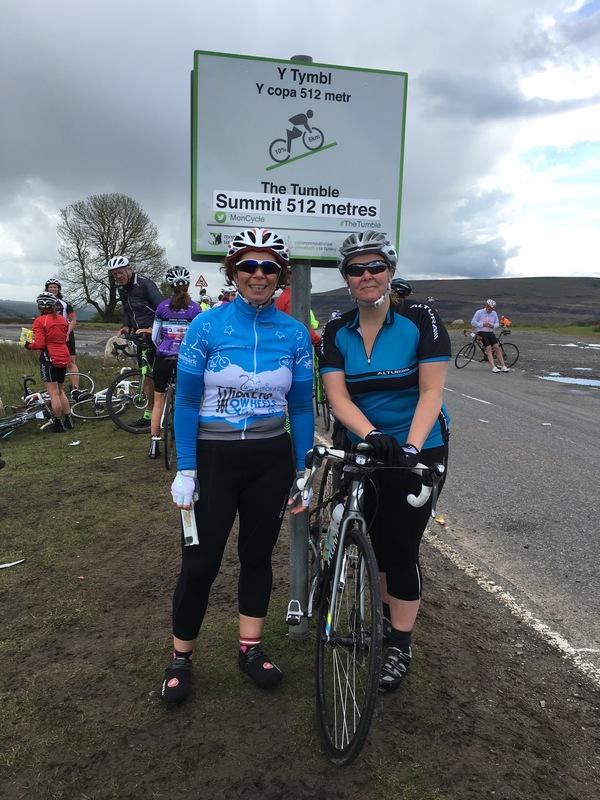 Six & half hours of riding time in the saddle and 140km completed, Tracey’s longest ride and probably most challenging. We were happy but hungry. Quick cuppa and burger then rode back to the hotel and car where they were kind enough to give us towels and let us use the showers and spa area. It was well organised & marshalled on the day, closed roads were a luxury, great scenery, challenging enough with plenty of undulations and a great day out ( apart from the rain !). I’ve registered interest for next year as long as its sunny & hot. 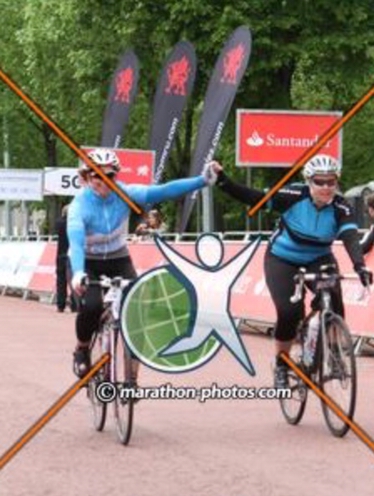 This is how you finish a bike ride – hand in hand with your biking buddy. 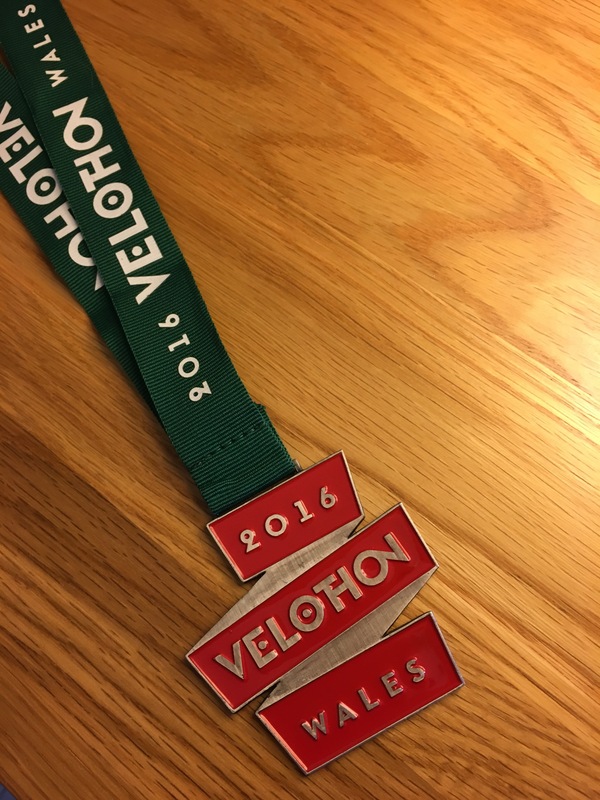 Together from start to finish at Velothon Wales 2016. Name call out too. Nice work. Riding the steep hills of Wales on a 25T cassette? Hard as nails!